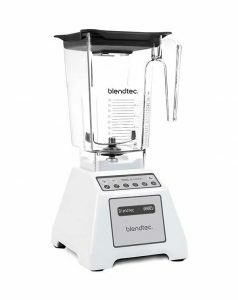 The Blendtec Total Blender is a highly versatile heavy-duty blender that can handle just about anything you throw at it. 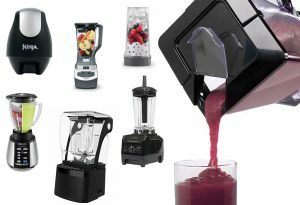 Whether you are grinding nuts for butter, making a smoothie or crushing ice, the blender’s three horsepower motor and thick stainless steel blades pulverizes them all in seconds. This is a commercial-quality blender designed for everyday use at home. That means you get a combination of raw power and ease of use. It’s not a cheap blender. The price tag is a bit over $350. But it’s worth it, and most customers agree. It’s not every day that you get a blender that does everything well. Instead of buying 5 or more different blenders and appliances for various uses, this one is enough. Instead of wondering what it can do, you should be asking what it can’t do. There are dozens of recipes you can prepare using this blender. It’s one of the best smoothie blenders with a setting specifically for blending smoothies. Whether you throw in fresh or frozen fruits, the thick stainless steel blades create creamy smooth goodness. There are no chunks at all. Or imagine you are in the mood for margaritas. The Blendtec Total Blender Classic is not a dedicated margarita maker, but that doesn’t stop it from producing chilled smooth drinks to while away your afternoon. Or maybe you are making Saturday morning pancakes for the whole family. You can use the Blendtec Total Blender to quickly and effortlessly prepare enough batter for the breakfast feast. It’s also really good at blending ice, turning it into fine snow in just seconds. The impact-resistant jar will not break or crack no matter how hard your ice is. It can even make hot soup. Just throw your ingredients in and the blender will blend them with such force that the soup gets hot. Other things you can make in the blender include ice cream, veggies, whole fruits, nut butter, sauces, milkshakes, salsas and whatever else you want to pulverize into a fine powder or liquid. This is one of the best features of the Blendtec Total Blender. Like many people, I estimate the blending time when making smoothies. I’ll stop the blender when I think the smoothie is ready and chunk-free. 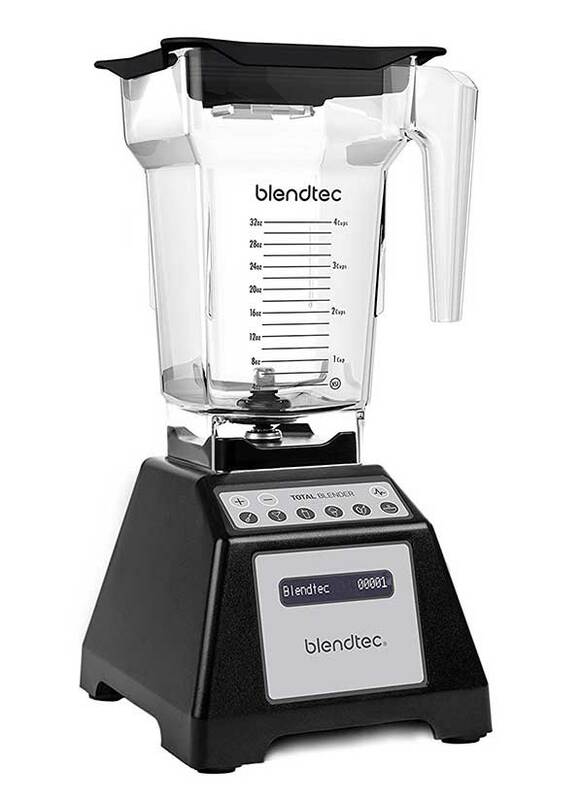 The Blendtec Blender allows a more precise operation. There are six pre-programmed buttons on the control panel for smoothies, batter, ice cream, whole juice, hot soup, and ice. So you just need to press a button, and the blender does the rest. It will set an automatic timer and spin the blades at the right speed. This ensures you get better results. If it’s ice, it’ll get finely crushed. If you are making a smoothie, it will come out smooth and creamy without chunks. If it’s soup, it will be properly hot. So even if you don’t consider yourself a blending ninja, you can still wow your guests with perfect smoothies and soups. Even with the pre-programmed buttons, you can still take control of the blending process. There are ten speeds to choose from plus a pulse button for when you need more precision. All the speed and pre-set buttons are on the touchpad. There are no clunky physical buttons to press down. Just touch the button, and it responds immediately. This blender would be right at home in a juice bar, a coffee shop or restaurant. Though designed for use at home, it has the power and builds of the commercial blender. The base is made from tough molded plastic. The jar is made from impact-resistant copolyester, a tough BPA-free material that doesn’t crack easily. 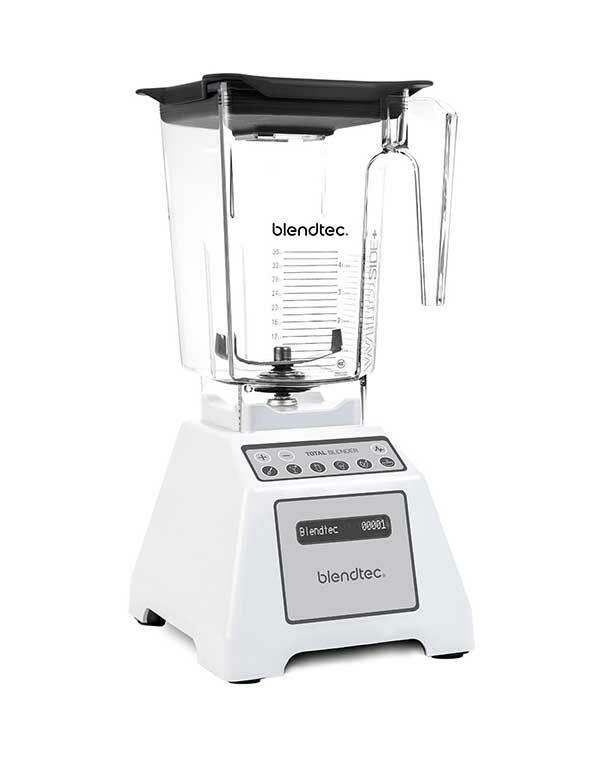 To prove to you just how well-built the Blendtec Total Blender is, the manufacturer provides an 8-year warranty. You are making a long-term investment here. Even the motor is made for heavy-duty applications. At 3HP peak power, it can blend any food whether it is nuts, while fruits or veggies. It’s able to blend finely and quickly without leaving large chunks behind. The blades are stainless steel and designed to be extra thick and hardy. They can blend ice and other hard foods without getting damaged. The thickness also improves safety. There is little risk of cutting yourself as you wash the blender. What I love most about this blender is how it’s so easy to use despite its commercial-quality power and design. It’s big but still compact enough to fit under most kitchen cabinets. You can also use it in your RV, boat or small office kitchen. The blender comes with a recipe book with 200 easy recipes you can make at home. Each recipe will tell you what ingredients you need and what pre-set button to press. There are recipe ideas for margaritas, soups, salsas, smoothies and ice cream. Note that the recipes are just general guidelines. If your smoothie turns out too thick or too thin, feel free to change a detail or two. You can also try your recipes with custom speeds and blend times. Remember to write down the steps so that you can replicate it later if it turns out well. With over 900 Blendtec Total Blender reviews on Amazon, this is one of the most popular blenders. Most of the reviews are positive with 78% of customers giving it a 4 or 5-star rating. The overall rating is 4.2/5. Most users point out just how powerful the blender is. It handles everything with ease whether its ice or fruits. Many also love the convenience of the pre-set cycles. They don’t need to know what speed or blending time is appropriate for a specific recipe. The main complaint was the noise. Because of its powerful motor and fast spinning blades, the blender can create quite a raucous, especially towards the end when everything has been pulverized, and there is no resistance. So be ready for that. If you are looking for a powerful multi-purpose blender, you can’t go wrong with this one. Yes, it’s pricey, but it does the work of several other appliances. And with the 8-year warranty, you can be sure your investment will serve you for long.